How to Treat a Severe Bleeding Injury! Have you ever cut yourselves and created a severe bleeding injury? Continue to read our blog to find out the bleeds that can cause shock and our top tips to STOP a severe bleeding injury. Do you work in construction, manufacturing or on a building site where you are at a high risk of having a severe bleeding injury? If so, these areas are the most common to have a severe bleeding injury. There are many precautions you can carry out to prevent having a severe bleeding injury. Ultimately you NEED to wear your PPE – personal, protective, wear if you work in construction, manufacturing or on a building site. Your PPE will help minimize the severity of having a severe bleeding injury. Not only your PPE, following your health and safety procedures and risk assessments will reduce the injury. 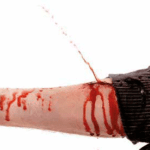 How to Treat a Severe Bleeding Injury? Our Top Tips! 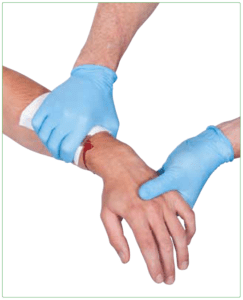 First, it is important to stop and manage the severe bleeding injury as soon as you can. There are three types of bleed you could have. These are; Arterial bleed – where it will spurt. Venous bleed – where it will ooze. Capillary bleed – where it will trickle. The first two bleeds – arterial and venous, are the worst bleed you could possibly have. You can loose a lot of blood in a short amount of time and it is hard to stop these severe bleeding injuries. Having a capillary bleed is the most common bleed you could have. This bleed, it will be able to blood clot and will be the easiest to stop with applying pressure. Sit or Lay the casualty down. Apply pressure, until the severe bleeding injury has stopped, we aim to apply pressure for 10 minutes. Apply a bandage. If the bleed comes through, we apply further pressure and a new sterile bandage on top. The bleed can’t stop! There will be a lot of blood being lost, shock may be present. If your casualty is cold and clammy, grey looking skin, with blue tinges to the face and lips, they are showing signs of shock. You will need to know when it is time to refer them to hospital. To treat for shock, you need to lay your casualty down, and raise their feet by 12 inches. It is time to take them to hospital or call 999. This entry was posted in a severe bleeding injury, Children's First Aid, courses, First Aid Courses, first aid kits, firstaid, Health and Safety, Stafford, Stone, walsall and tagged a severe bleeding injury, First aid courses, first aid training. Bookmark the permalink.